“It went from nothing to a flood,” a witness said. 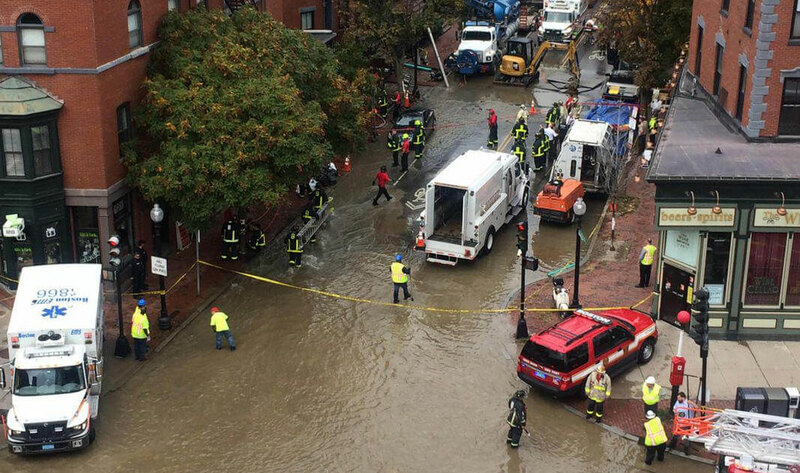 A water main had burst at a construction site in Boston’s South End. The trench around it was quickly filling with water, overflowing onto the street and beginning to cave in. Two construction workers were trapped. Down the street, Billy O’Brian and his 14-member crew, IAM Local 100 (District 15) members who work for Boston Water and Sewer, were finishing up a different job when he got an emergency alert on his phone. A water main had burst. People were in trouble. Everyone at his site was safe. Good. So they grabbed what they always keep around—water pumps that can “dewater” a trench like a giant vacuum—and headed to the scene. They arrived to confusion, but went to work right away. They got on their hands and knees to dig out the 12 by 20-foot trench, doing their best not to cause another cave in. Alone at first, then with Boston Firefighters, Police and EMTs. It had gone from a rescue to a recovery mission. And there was still very real danger. The bodies of Robert Higgins, 47, and Kelvin Mattocks, 53, were pulled from the trench at about 8 p.m.
Higgins and Mattocks worked for Atlantic Drain Services, a contractor that before the incident had received citations for workers lacking oxygen underground and for conditions that could lead to cave-ins. OSHA is investigating the deaths. Local 100 members were able to cap the bursting pipe and installed a “trench box” to prevent another cave in. Working methodically, they were able to recover the bodies. Eastern Territory General Vice President Jimmy Conigliaro, Sr., called every IAM member involved to say thank you. The IAM would like to thank every Local 100 member involved in the effort: Aice Blackwell, Billy O’Brien, Jon-Michael Blythe, Sekou Brown, Rene DelValle, Adelino Fernandes, Barbara Gillis, John Greeley, Paul Kilroe, Mike Phillips, Abby Rodriguez, Mike Satchell, Franco Torres and Matt Winik.